The trip to Dumaguete almost failed to take off. This was because the cab driver bringing me to the airport decided to engage in some form of highway robbery. The old geezer tried to sweet-talk me into forking out P400 for the airport run from Quezon City, citing high fuel prices, the time he reportedly spent “waiting” for me, and the huge costs of raising a family, mainly his. I had no control over the first, requested no such arrangement regarding the second, and hardly cared about the third. Had the offer been made during rush hour — a time when empty cabs were fewer than presidential candidates — I would have pawned whatever remained of my soul just so I could get to the airport on time. But it was four in the morning. The only people on the road were drunk drivers, drag racers, and cab drivers, one of whom was trying to swindle an unsuspecting passenger armed only with a travel toothbrush so old the bristles fell off. 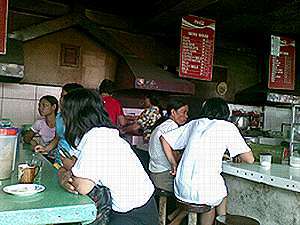 Diners enjoy inexpensive but tasty food — including native coffee and suman — at the Dumaguete market. Since I was not prepared to let go of my cash that easily, or at least not until I was threatened with physical harm, I told the cab driver to pull over because I wanted to get off. He refused to call my bluff, knowing that nothing was worse than driving an empty cab along deserted streets during the wee hours (that is, next to being swindled inside one). He then shifted smoothly into the charm drive. After switching on the fare meter, he began to inquire about my final destination and proceeded to discuss the mundane intricacies of the weather. I obliged, even though I was in no mood to chew the fat. During what at that time appeared to be an inordinately long airport run, I even allowed him to use my phone to text his one and only wife. And that, fortunately, was the end of my encounter with Mr. Not So Smooth Operator. From then on, the trip to Dumaguete — from takeoff to touchdown — was uneventful. After all, I was temporarily leaving Metro Manila to take it easy. And Dumaguete is among the very best places to let your hair down. Life remains at an unhurried pace in the City of Gentle People that until now, even during weekdays, some offices and establishments close at twelve noon, allowing supervisors and staff alike to kick back and enjoy a two-hour siesta, well-deserved or otherwise. The time-honored tradition has long unsettled workaholics, many of whom have probably chosen to move to Manila and lead lives at a pace of their choosing. The siesta certainly worked wonders for slackers. But that was 14 years ago, when cellphones were bigger than car batteries, laptops were the size of luggage, and I — ehem — was a fellow of the Dumaguete National Writers’ Workshop. As a fellow, not only was I entitled to a three-week long, all-expenses paid stay in Dumaguete, I learned that drinking cold beer was the best way to while away a siesta. Sure, I also benefitted from the advice of older writers, a number of whom implied that I was better off doing something else (i.e., selling shower curtains, aluminum siding, and other implements crucial to a functional, well-run household). My first visit to Dumaguete changed my life for reasons too indulgent to be mentioned. And early this month, for the first time in 14 years, I came back to see if I could bring back that pseudo-literary, slacker feeling. Except that this time, I had to foot the bill. No such fellowships were awarded to overweight, mid-career slobs yearning for fond memories, lost youth, and free beer. #justasking: does Manila really have one of the world’s worst airports? P400 for a Kyusi-NAIA run? [email protected]#t. Even during rush hour the meter won’t go above P350. Well, Dumaguete is still the same – minus the cheap beers. Hehehe… ;) I’m from Dumaguete btw. Thanks for reading. There’s a second part of that travelogue but it still remains to be written. Work is the curse of the writing/drinking class.